From the comments to the CD: Aukštaitija. Aukštaičių daugiabalsės dainos ‘Aukštaitija. North-Eastern Lithuania. Polyphonic songs of Aukštaičiai.‘ Lietuvių tradicinė muzika ‘Lithuanian Traditional music.‘ Compiled by Daiva Vyčinienė. 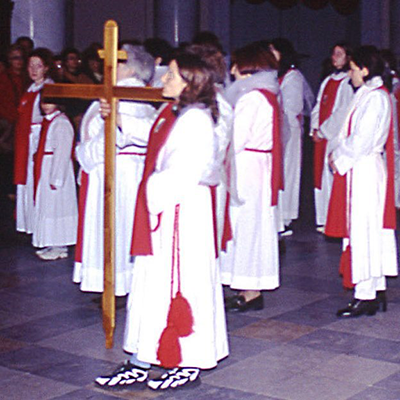 Vilnius, 2002. Aukštaitija ‘Higher/Upper Lithuania‘ (the North-eastern area of Lithuania) is considered the most appropriate region to investigate different styles of folk music. Here up until the middle of the 20th century the most archaic polyphonic songs, sutartines, shepherds’ ancient monophonic songs, pasture calls-signals and imitations of birds survived. From 19th century and on multi-voiced (homophonic) songs were live alongside them, which have survived up to this day. This diversity of singing styles and genres of Aukštaičiai is presented in a serial publication of phonograph records (compact discs and audio cassettes) of Lithuanian Academy of Music “Lithuanian Folk Music II. Songs of Aukštaičiai. 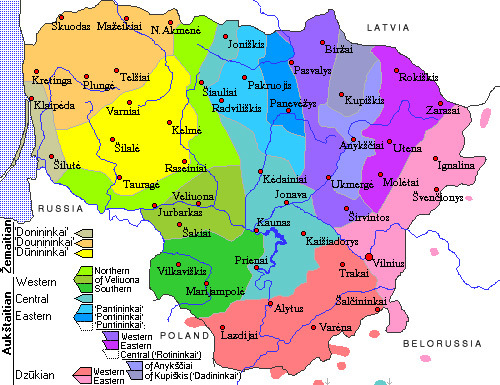 North-Eastern Lithuania” (compiled by Genovaitė Četkauskaitė). The individual CD “Sutartinės” (compiled by Daiva Vyčinienė and interpreted by the group of the sutartinės performers “Trys keturiose” ‘Three in Four’) of the Lithuanian Traditional Music (LTM) series was designed to ethnographic sutartinės, a unique phenomenon of Lithuanian folklore. Regrettably, the bulk of ancient songs from the above records (sutartinės in the first place) are no longer sung in Lithuanian villages. They are the treasury of the Aukštaičiai folklore which has become nearly extinct or has remained in the minds of not many singers. Differently, later multipart songs, which in Aukštaitija became prevalent comparatively not long ago (19th c.), continue to be sung. Of late singing without accompaniment (turavojimas) has been regarded as impossible by Aukštaičiai – as soon as an Aukštaitis happens to hear a melody even unknown to him he immediately tries to accompany it – antrinti, turavoti, bosuoti ‘to repeat, to take the second part, to take the bass part’, and the like. It is commonly presumed that the accompaniment to the first part by thirds (at times by fourths and more frequently by fifths) is the only one that is appropriate to the songs throughout all environs in Aukštaitija. 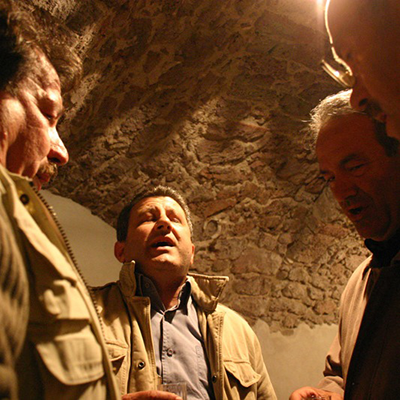 Particularly this way of accompanying the songs in Aukštaitija – the “traditional” one – is being practiced by most folk companies in towns, getting thereby styles of singing in different locations very alike. Different accompaniments in remote corners of Aukštaitija have survived to this day. This indicates not only a vital capacity of multipart singing and immeasurable faithfulness to local traditions but also the closed character of the traditions – the kind of a peculiar local patriotism. As for instance, women of Nibragalis feel very proud of the fact that earlier, too, no one except for them sang with a “bass” (nebosavojo ‘did not practice the bass singing, did not take the bass part’) in the neighborhood. Otherwise, we who are accustomed to the “traditional” accompaniment of Aukštaičiai, regard this kind of singing as somewhat unusual. 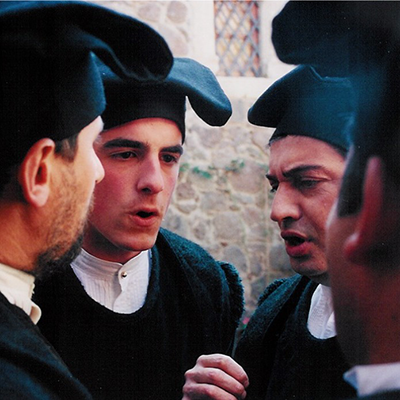 Many music lovers (particularly specialists - ethnomusicologists) were caught up with an unfathomable astonishment when they happened to hear for the first time songs of Nibragalis (with bosavojimas ‘accompanied with a bass’) on the Lithuanian radio several years ago. Does drone exist in Lithuania?! It is unbelievable! 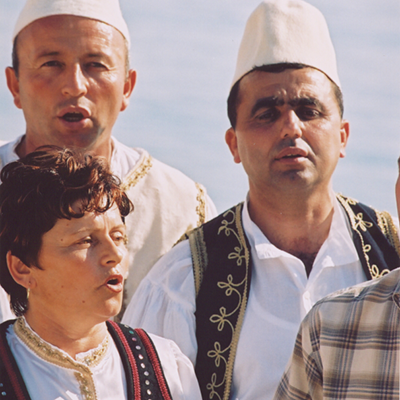 True, the Nibragalis singing with the bass part (su bosavimu) can not be identified with the archaic bourdomal singing of the nations on the Balkans and Caucasus (an uninterrupted bourdon or the so-called “bag-pipe” bourdon is widespread throughout the above nations; while singing acute second accords are not rarely formed beween separate parts. Songs in Nibragalis are characteristic of later homophonic multipart interpretation and, yet, a direct influence of functional harmony is absent there (the reiterations of the same sound in the bass part of the song from its very start to the end with the tonic six-four chord as if added at its end seems to be inadequate in terms of the laws of functional harmony). A specific way of interpreting songs in Nibragalis thereby denies the supposition on the ultimate absence of the bourdon in Lithuania. On the ground of the above examples we may speak of the tips of the Lithuanian burdonal singing tradition. True, its origins have remained vague. It is obvious, however, that the Nibragalis singing with the bass is to be regarded as atypical accompaniment of homophonic music. It is one of the greatest “discoveries” of the 20th century for Lithuanian ethnomusicologists. The way of accompanying by both the tonic and the subdominant was first recognized by the song collector Juozas Kartenis. In 1935–1936 over ten such two-part melodies were recorded by him in Ukmergė including also the parishes of Gelvonai and Bugališkis. 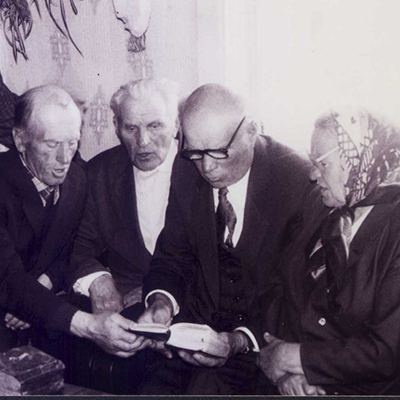 In 1985 a live tradition of “bass singing” was detected in Raguva – three-part songs with one of the parts producing a bass tune were recorded during the folklore expeditions organized by the Lithuanian Academy of Music. In the early 20th century a similar three-part singing was described by the priest Adolfas Sabaliauskas: “one or several singers sing a melody while others accompany to it, i. e. they chant in a lower tune by a third or bosuoja ‘take the bass part’ thereby adding the third part, which in usually represented by the tonic, the dominant and the seventh (“Musical Notes of Lithuanian Songs and Hymns”, 1916). It may be presumed that such interpretation of the third part bosavimas ‘making it the bass part’ is a phenomenon of later origin which became prevalent in effect to highlight the harmonic functions (i. e. as if the third part later “adhered” to the first two ones). However, the second part – the middle one – introducing thirds seems to be lacking in the two-part bass songs recorded by J. Kartenis. It maybe concluded that the former way of accompanying could have been a bass interpretation while the third part (the middle one) would emerge only on the occasions when singing was performed by a larger group of singers. True, J. Kartenis indicated that some songs “are performed either by accompanying in a common way – by thirds turavojant or by adding the bass bosuojant.” Supposedly, the accompaniments to songs functioned side by side and singers had an opportunity to choose either of them. Or, may be they were two constituent parts in three-part singing(songs including both the middle part and the bass were also indicated by J. Kartenis)? Moreover, women in Nibragalis also present some of their songs either with a common accompaniment of thirds or with the bass bosuojant (this way of singing seems to be nicer to them – it presents a richer sounding) interpreting them thereby in two ways, too. Options to interpret the bass with either one or several sounds in the traditions of different villages of Aukštaitija were predetermined by specific regulations of the melody patterns of songs. Characteristic intonations of all songs containing the bass are based upon the b-a-d variants of the trichord and the extensions (g-d-a-b or g-(b)-a-d-a-b, and so on); the tunes of the leading part are most frequently in lack of the fourth degree; the repetition or the prolongation of the fifth degree is popular. Under these “rules” of the melody patterns singing with a bass introduce an exceedingly harmonious sounding: frequent triads and six-four chords. Accompaniments of both Kruoja and Žiemgala in particular are also somewhat unusual. In the mixed male- and female singing the low part is commonly attributed to the leader (male or female) by whom a low and somewhat harsh sounding of the song is predetermined. In singing at the lower register upper parts are commonly used with some women accompanying (turavoja)not only in the lower pitch but also at the upper register (by the interval of the sixth higher than the main melody). Several parts (and different timbres) are thereby composed. They are represented by the leader, males uttering by a third, females uttering by a third (at the same pitch as males), females uttering by a sixth from above. Two more parts are also possible; the part interpreted by women (or one woman) doubling the leader’s part an octave higher and the part performed by men dublicating the men’s part an octave lower. Such way of interpretation might be called a multi-layer, multi-timbre singing, appropriate for a large mixed-voice ensemble. 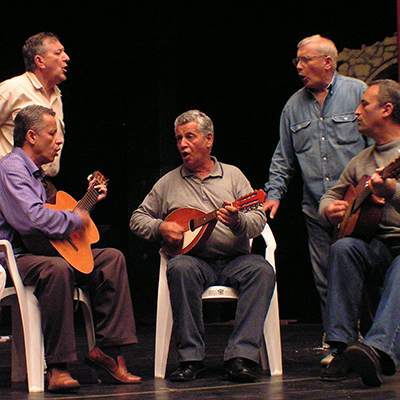 The performing of the singers of Šeduva distinguishes itself not that much by the variety of accompaniments (turavojimas regarded as “traditional”, the so-called Aukštaičiai singing) as by a somewhat darker colour of the timbres of voices (the singing of the women of older generation is particularly characteristic of this). The singing of men of the Žiemgala is characteristic of an immense power, suggestiveness as well as “wild” colour of the sound (while listening to them one may be caught up by the associations with sixteenth-nineteenth foreign croniclers’ and travellers’ claims about the Lithuanians harsh singing reminding of the howling of wolves).